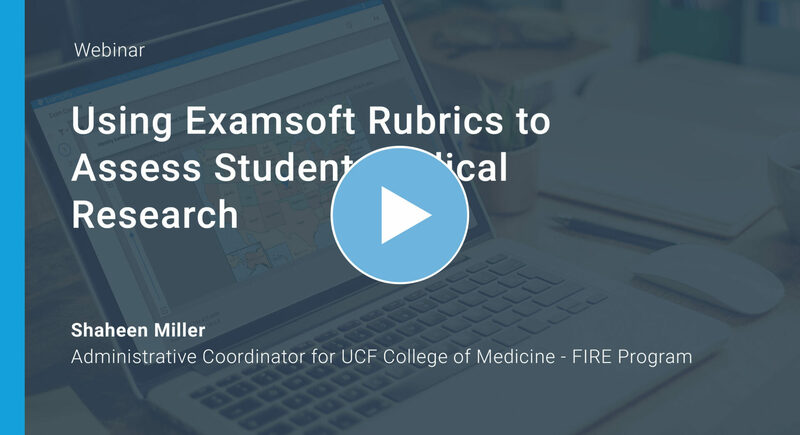 At the UCF College of Medicine, we use ExamSoft Rubrics to assess first and second year medical students for our unique research program called FIRE (Focused Inquiry Research Experience). All students are required to complete a 2-year research project on a topic of their choice in the field of Medicine/Health. We use the ExamSoft Rubrics platform to assess students’ papers in the first year and posters in the second year. Students receive formative (not graded) and summative (graded) feedback from peers, faculty, statistician, and librarian. This webinar will explore how to create and administer these assessments of student learning. ExamSoft allows you to create assignments with multiple rubrics specific to reviewer expertise (Faculty, Peer, Statistician, and Librarian). Advanced User tips and tricks on creating the assessment, grader assignments, and creation of anonymous reviewers was shared. Feedback to students from multiple graders can be provided using the Strengths and Opportunities Report.